Point brings ball to elbow extended. 2 looks to help or receive pass from 1 and start the play on his side. 3 assumes high post and looks for quick entry pass from 1. 4 & 5 take low post positions and block in their defenders. If neither is open, dribble to the wing area. 3 will come strong side elbow and look for the high low action. 2 & 3 move into position to receive the pass from 1. 4 posts up hard and asks for the ball. 5 checks his man and make sure he doesn't help in the lane. 1 now has: 2 on the point, 3 on the elbow, and 4 down low. If the defender closes out wrong, dribble penetration is available with down screens from 3 & 4. If 1 cannot make the entry pass to 3 or 4, 4 will pop out to the corner. High post will flash cut to low and backside low post will cut to High post. 3 should be open cutting down low or 5 at the high post. If not pass to 4 in the corner. We have now overloaded the zone while maintaining good passing triangles. Action reverses with the pass to 1. All post players assume their starting positions and look for quick passes. 1 looks for 3 and passes to 2 to reverse the play. 2 dribbles to wing and play starts on that side. 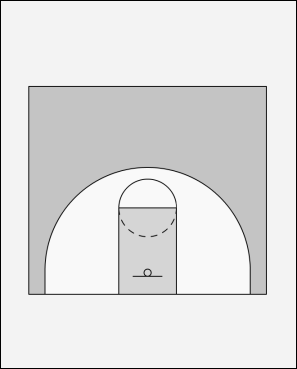 2 has 1 at point, 3 at high post, or 5 at low post. When the low post is doubled, the high post will cut into the lane for the dump off. Dump the ball off when doubled. If backside help comes dump off again for the easy score.